Orthopaedic surgeons studying the Master of Orthopaedic Surgery (MCh Orth) course at the Department of Orthopaedic & Trauma Surgery spent two days at the Centre for Anatomy and Human Identification (CAHID) attending and participating in Thiel soft-embalmed cadaveric workshops on 19-20 April 2017. 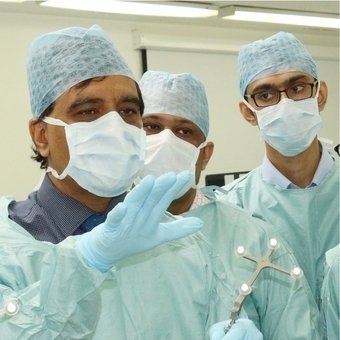 These Total Hip and Knee Workshops were presented by one of the world’s most highly respected computer navigation orthopaedic surgeons, Mr Kamal Deep, who used four computer-aided Orthopilot® navigation arthroplasty systems on the cadavers. Mr Deep was assisted by his Orthopaedic Fellow, Dr Shivakimar Shanar and B Braun Medical Ltd. representatives, Gillian Dawson and Emma Smith. Also on hand organising and running the workshops were staff from CAHID, Samantha Skene (Senior Anatomy Technician), Sheryl Paton (Anatomy Lab Technician), Gillian Malone (Admin Assistant) and from the TORT Centre, Sheila MacDonald (MCh Orth Course Administrator) and Sadiq Nasir (Speicalist Postgraduate Tutor). Normally in similar workshops a lead surgeon will demonstrate such procedures on a single cadaver to a group of observers or a group of perhaps half a dozen surgeons but here at the University of Dundee each and every MCh (Orth) student has their own cadaver to apply the surgical techniques to, which is a unique feature of this course. “I would like to take this opportunity to thank Professor Sue Black and Professor Tracey Wilkinson and the team at CAHID for giving us the opportunity to run these unique Thiel cadaver workshops every year. The continued support and shared expertise only reinforces how we continually strive to improve upon the course syllabus of this already successful world-renowned surgical degree that the Royal College of Surgeons of England regards as one of the leading courses of its kind” said Professor Rami Abboud, MCh (Orth) Course Director and Head of Department of Orthopaedic & Trauma Surgery. Please note that due to our strict adherence to Thiel copyright and legal agreement we are obviously restricted as to what imagery we can show in the public domain. But we would like to pay tribute and thanks to all individuals who donate their bodies to the advancement of medical research.